TV show dates: February 20, 2017 — April 10, 2017. Performers include: Afton Willamson, Wood Harris, Tristan Mack Wilds, Antoine Harris, David Call, Evan Handler, Melonie Diaz, Sinqua Walls, and Ali Ahn. This dramatic TV show is based on the television movie of the same name which was inspired by the book by Dan Charnas titled The Big Payback. 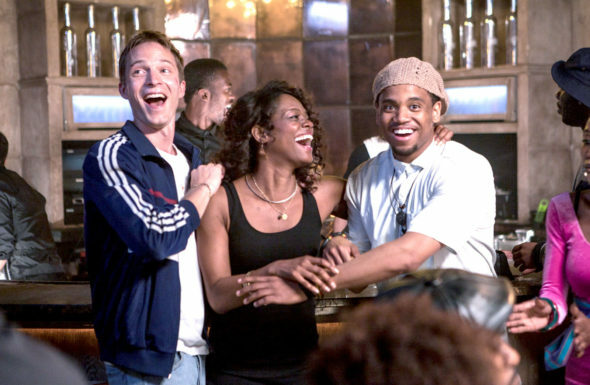 The series is set in New York City in the 1990s and revolves around three friends who love hip hop and work to make their mark on the music industry. Nikki Jones (Afton Willamson) is a brilliant and recent graduate who abandoned a scholarship to law school to pursue her dream of becoming a record executive. Her boyfriend, David Aaron (David Call), is the scrappy son of a legendary music producer who is unwilling to rest on his father’s laurels and notorious reputation. Daryl “DeeVee” Van Putten, Jr. (Tristan Mack Wilds) is an aspiring producer on the hunt to find the next big rapper on the come-up. Nikki fast-talks her way into an internship at the premier hip-hop company, Fouray Entertainment, and catches the eye of the label’s infamous founder (Wood Harris). Meanwhile, David struggles at the city’s top R&B radio station whose celebrity DJ refuses to program real hip-hop. DeeVee returns to his roots in the Fort Greene projects to scout for talent and runs into Ahmed “Ahm” Harris (Antoine Harris), a drug dealer with a lyrical gift whose talent could bring them all to the next level. The trio soon discover lives can be broken as fast as legends can be born. What do you think? Do you like The Breaks TV show? Should it have been cancelled or renewed for another season? I really loved the show and was wondering when it would be back on. Perhaps Netflix will pick it up. Wherever it goes im there i just want to see what happens to everyone next.